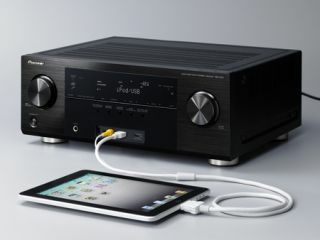 UPDATED: Pioneer's 2011 AV receivers get Apple AirPlay | What Hi-Fi? Two of Pioneer's new multichannel receivers, the VSX-921 and VSX-1021 (above), are equipped with Apple AirPlay for network music streaming. This gives owners complete access, control and playback of their entire iTunes music library from an iPhone, iPad or iPod Touch. Both Pioneer models can be connected to a home network via ethernet or wi-fi (using the company's optional AS-WL300 wireless LAN converter). Along with AirPlay, the receivers are also compatible with new Air Jam and iControlAV2 apps. Air Jam allows users of the VSX-921 (below) and VSX-1021, equipped with the optional AS-BT200 Bluetooth adapter, to stream music directly through the receiver. Air Jam can simultaneously connect up to four source components to the receiver via Bluetooth. For owners of Apple's iPad/iPhone/Touch, Pioneer's iControlAV2 app turns the portable devices into full-blown controllers, handling operations such as the receiver's volume, bass, balance and room settings. As for the rest of the tech specs, the VSX-1021 and VSX-921 each deliver 150W across all seven channels, decode HD audio, have MCACC room calibration, upscale video to 1080p, include internet radio and can accommodate a second zone. Additional multtichannel receiver models coming to the Pioneer 2011 range are the VSX-821, VSX-521 and VSX-421. They deliver 130W across five channels, but don't have Apple AirPlay compatibility, internet radio or compatibility with the new apps. All the new Pioneer receivers will be available from June. Both apps are available free from the Apple App Store. Pioneer says it will launch more AirPlay-compatible devices this summer. We've requested UK prices and will update this story as soon as we get them.